Synthetic Scents – Lucky 7 Synthescents are the Best on the market! Real Urine Scents – Lucky 7 real urine scents are the FRESHEST you can get. Cover Scents – Both the Lucky 7 Premium Cover Scents and our Cover Scent & Spray Attractant are proven winners. Scent Elimination – Remove your odor from your person and gear. 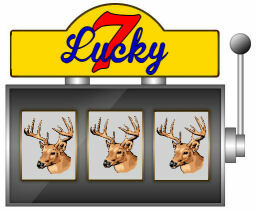 Deer Attractants – Lucky 7 makes mineral and food-based attractants that will bring deer in. Hunting Game Calls – NCO class work well under all weather conditions and are affordable. Fish Attractants – Catch more fish with Lucky 7 Fish Attractants!